We may still be experiencing snow across the country, but I won’t let that stop me from shopping for Spring. Spring is without a doubt one of my favourite seasons, is there much better than being able to step outdoors comfortably with just a jacket on? Last weekend I went full spring clean mad on my wardrobe, selling or donating anything I haven’t got much wear out of this year, which certainly leaves me on the market for buying some new gear, right? We all know I love a good wishlist don’t we now?! 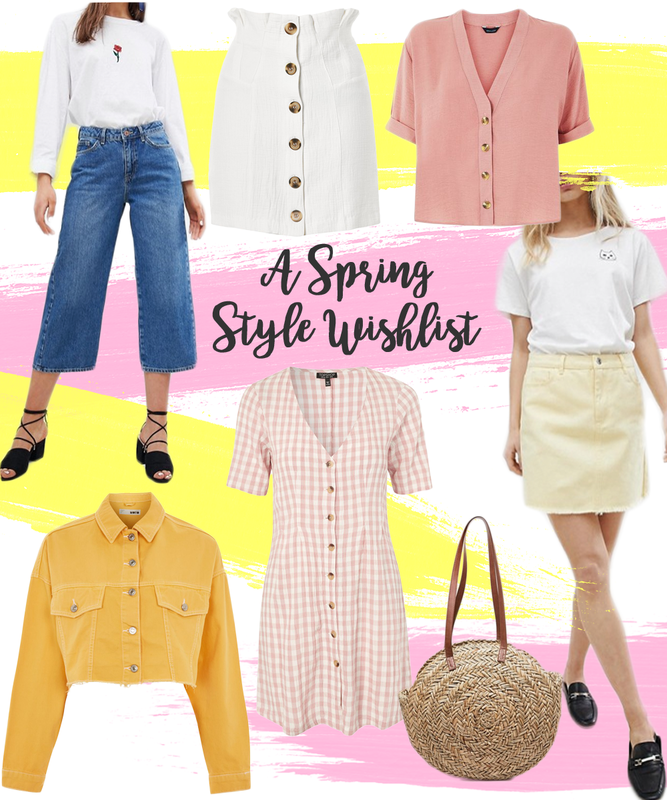 It seems there is a colour trend of yellow and pink in my picks – I’m all for the pretty pastel colours whenever spring comes around. It’s also evident that I’m loving buttons too, I’m not sure whether there’s a name for each style of button, but this skirt, shirt and dress from Topshop all seem to be sporting similar styles. Recently I declared my love for mom jeans, and how I much prefer this comfier style over skinnies, so I feel naturally the next step are some wide legs. I’m not too sure how I’d feel in these cropped numbers but I’m more than willing to give them a go. I’ve seen so many of these hacked off denim jackets right now, especially on Asos and Missguided. I can see them being the perfect spring jacket to chuck over a basic jean and tee, or skirt look. Paired with a classic straw bag (I’m yet to decide whether I need a small or big version.. maybe both?) and you’ve got your ideal spring look right there!